Instructor User Guide GradebookHow do I override a course grade in Gradebook? Note: When manually entering a course grade, you must use the appropriate grade type for the gradebook in which you are working. For example, if the course is graded on a simple letter grade scale, you will only be able to enter the letters A, B, C, D, or F. If the course is graded on a standard letter grade scale, you will also be able to add + (plus sign) or - (minus sign) to the letter grade. If the course is graded on a Pass/Not pass scale, you will only be able to enter the letters P or N.
In the Course Grades column, select the down arrow within the cell for the student's grade and choose Course Grade Override. Zoom: In the Course Grades column, select the down arrow within the cell for the student's grade and choose Course Grade Override. Enter override score and save. Enter the new course grade to replace the autocalculated grade. Click Save Course Grade Override. Prev: How do I import grades into Gradebook? 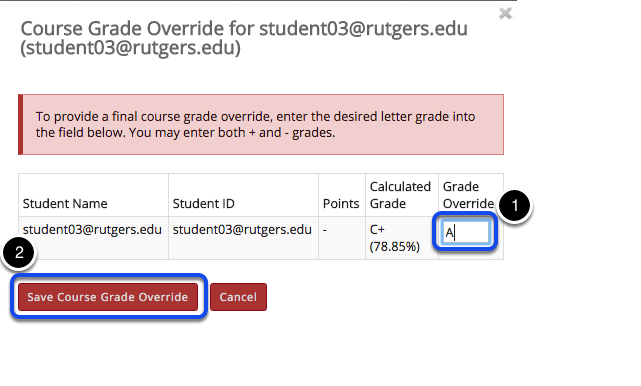 Next: How do I view the course grade override log in Gradebook?